"Got my jets in today and they look great and are just what I ordered. Thanks guys. " 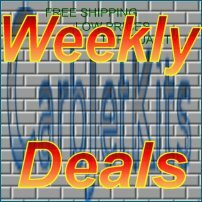 I asked and got help on what I needed ,ordered the kit on a Sunday..."
"Great is all I have to say from the calculator shipping price and the best part how to do it. I..."
"I have never done any carb work on any motorcycles but thought I would try it. I ordered it on a..."
"I am very happy with the Jet Kit that I purchased. My 1986 Honda Shadow has never ran this good...."